Here is a collection of items I have managed to scavenge, this is not a complete list, there are still other items out there..
Holy crap I had no idea you could wield any of the stuff you scavenge. I thought it was all components for crafting. I did find a plastic bat last night but I couldn't use it so I guess some things are that way. That's an impressive array of weapons. edit: I want that screw club so I can pull out my opponent's intestines like a clogged drain. I guess I should start making screenshots of the items I find scavenging. Here are a couple more weapons to add to the list. Unfortunately, I found these before the last server wipe. Funny story. The first one I found I took a screenshot and added to the paint file but I forgot to save the file and a blackout caused me to lose the screenie and i discarded the item, so that one pictured was actually the second one I found. I found 5lb and 10lb weights and thought that they were odd items. What could we do with those, weight lifting? Then I found a 10-lb club which was a pipe with a weight strapped on it. That was prior to the last wipe so no screenie. Golf clubs are common item to scavenge and as you can see, likely used for a Nine Iron Club. 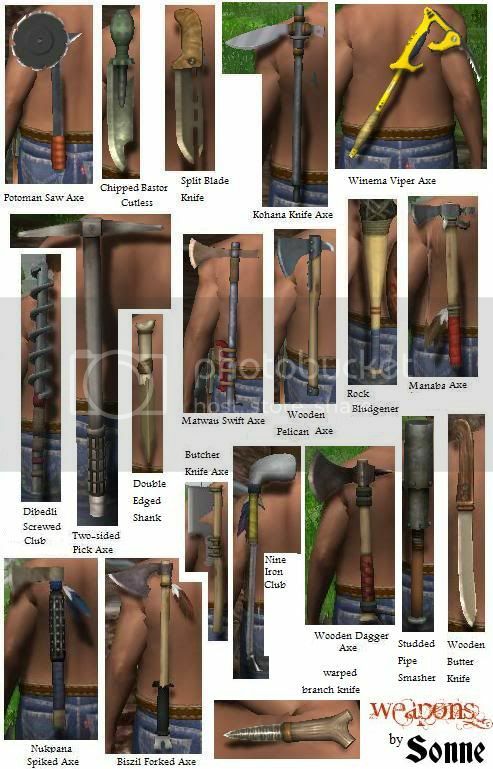 If you look at the Rock Bludgener and the Studded Pipe Smasher, both appear to require a bat to use as a handle. So I've been scavenging just to find these items and materials to get a sense of how crafting will work. So if I am a weapon crafter and I find a Nine Iron Club, could I analyze the item to add that recipe and then produce them myself or would I have to find a book? I dunno. @Kit. I wasn't really trying to build a catalog of all weapons because I know I had other types before I lost those screenies. I was just giving an overview or general idea of what type of items are in game to show diversity of gear. Plus to benefit new folks to show a sample of items in game in a more concise fashion. I would do it with armor/clothes too but those are not scavenged. Thanks cbowsin very good job! I should have taken some screenshots from weapons I found before as well. Yea, I think a lot of people will be changing after this post.